Known to many as "The Magician," Antonio Esfandiari saved his most stunning trick for Tuesday, July 3, 2012 when he came into the final table of the $1,000,000 Big One for One Drop with the chip lead and walked out the winner, and a massive $18,346,673 payday. When the final table began, Esfandiari was the man leading the way, trailed closely by Sam Trickett. Throughout the entirety of the final table, those two jockeyed for the top spot while everyone else was playing catch up. On the 23rd hand of the final table, the first elimination occurred and it was Richard Yong hitting the rail. He was all in preflop with the versus Brain Rast's . Yong was able to hold up on the first four community cards, but the fifth one was a king and gave Rast the winning hand. Just under 20 hands later, Bobby Baldwin dropped out in seventh place on the 41st hand of the final table. With the blinds in Level 20 at 250,000/500,000/50,000, Baldwin was all in with the versus Guy Laliberté's . A flop, turn and river ran out to leave Baldwin second best. Next to go was Rast in sixth place, earnings just over $1.6 million for his finish after he was eliminated by Trickett in an exhilarating hand during Level 21 with the blinds at 300,000/600,000/75,000. Rast had the button and Sam Trickett opened to 1.2 million from under the gun. Rast called and Esfandiari called from the big blind. The flop fell and Esfandiari checked. Trickett fired 1.8 million and Rast called. Esfandiari folded and the turn brought the . Trickett tanked, then led out for 3.8 million. Rast called. The completed the board on the river and Trickett tanked before moving all in for 8.275 million, effectively. Rast snapped it off, tabling for a flopped flush, but Trickett turned over for quad threes and won the pot. Laliberté fell in fifth place on the 60th hand of the day when his couldn't out-race the for Esfandiari in a massive clash for over 50 million in chips. As Laliberté left the tournament stage, he was sent off by chants of "Guy! Guy! Guy! Guy! Guy!" and given a standing ovation for all of his time and effort put into the One Drop project and this event. Just moments after that, Phil Hellmuth was eliminated in fourth place, falling short of his 13th gold bracelet. He was eliminated on the 62nd hand of the final table during Level 22 with the blinds at 400,000/800,000/100,000. Hellmuth's was up against Trickett's . An exciting flop of gave Hellmuth the lead, but he still wasn't anywhere near the safe zone just yet. The on the turn made things even more of a sweat for Hellmuth and, in the end, he just couldn't hold up when the fell to give Trickett a winning straight. For his finish, Hellmuth pocketed over $2.6 million and earned largest score of his poker career. With the tournament down to three players, David Einhorn was the shortest stack of the bunch. Einhorn was the man who had pledged all of his earnings from this event to City Year, an education-focused nonprofit organization, and he'll be sending a check of $4.352 million their way. Einhorn's went down to Esfandiari's as the board ran out and the battle was set between Esfandiari and Trickett. Esfandiari had a 2.5-1 chip lead going into heads-up play and it only lasted 16 hands. At first, Trickett started to chip back up, but Esfandiari made trip nines on the 81st hand of play to knock him right back down. Then, all of the money went in just a few hands later on the 85th hand of the final table. Esfandiari had the button and raised to 1.8 million. Trickett called and the flop came down . On the flop, Trickett checked and Esfandiari bet an unknown amount. Trickett came back with a check-raise to 5.4 million and then Esfandiari fired with a reraise to 10 million. After a minute or two, Trickett reraised to 15 million. Esfandiari raised all in and Trickett made the call. Trickett turned over the for a flush draw and Esfandiari held trip fives with the . Trickett was the player at risk with his 36 million on the line. The turn was the and Esfandiari stayed in front. 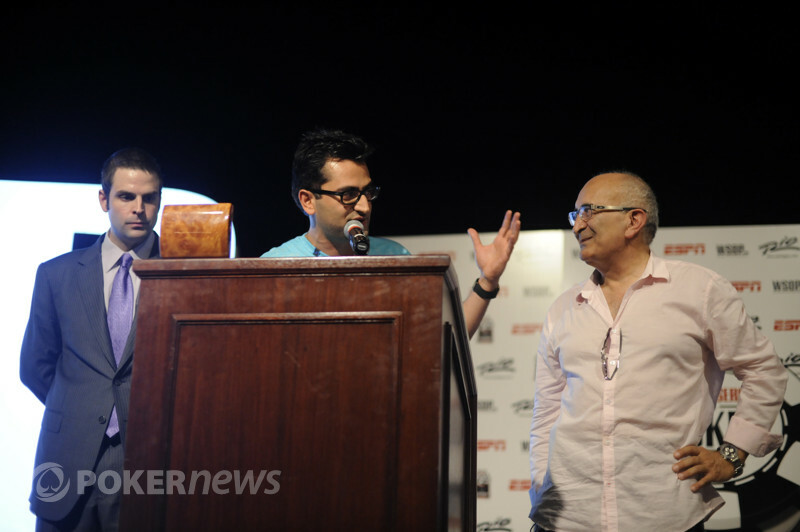 There was a long pause as everyone silently awaited the river card, no one more so that Trickett and Esfandiari as they stood in the middle of the stage awaiting fifth street. This river card would either swing the match in Trickett's favor or be the one that ended the tournament. The dealer burned and turned what ended up being the most expensive card in poker history, the . And with that, Esfandiari became the richest man in the history of poker. 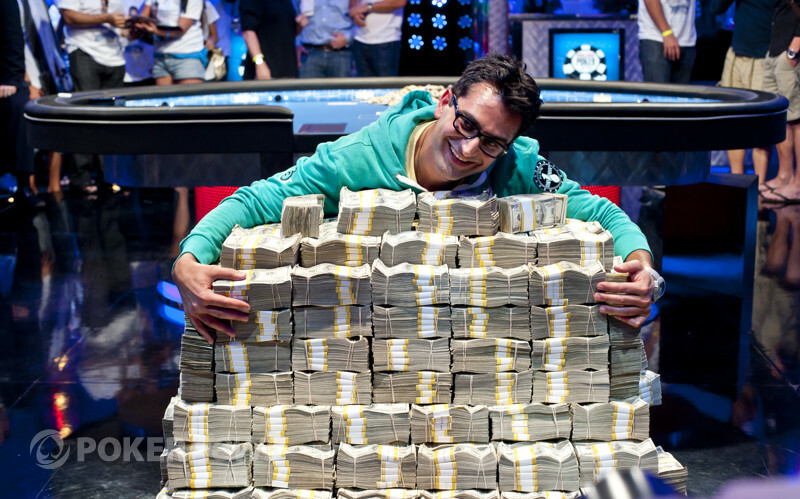 PokerNews would like to congratulate all of the winners and especially Esfandiari on his amazing achievement. The WSOP and the One Drop organization put on an absolutely spectacular event that won't be matched anytime in the near future. With his win, Esfandiari earned his second WSOP gold bracelet, over $18.3 million in prize money and has become the number one player on poker's all-time money list. Surely, Esfandiari will be riding on cloud nine for quite some time. Don't forget to check out all of our exclusive coverage from the 2012 WSOP and until next time, goodnight from Las Vegas! 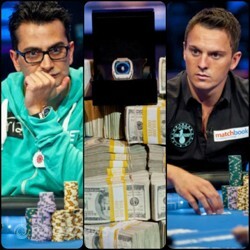 Hand #82: Sam Trickett began this hand on the button and gave Antonio Esfandiari a walk. Hand #83: Antonio Esfandiari had the button and gave Sam Trickett a walk. 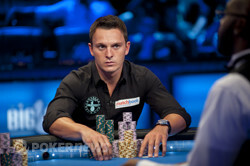 Hand #84: Sam Trickett was on the button and gave Antonio Esfandiari a walk. Hand #85: Antonio Esfandiari had the button and raised to 1.8 million. Sam Trickett called and the flop came down . The dealer burned and turned what ended up being the most expensive card in poker history, the . Esfandiari's hands hit his head as he pulled his hair and ran in circles on the stage, not believing what had just happened. He was mobbed by his fans who burst onto the stage and jumped up and down with him. Trickett was off with his rail, but no celebration was going on over there. Esfandiari's friends hoisted him high above their heads and roared in triumph. For his finish, Trickett earned $10,112,001 and the largest score of his career by far. Esfandiari, on the other hand, took down poker's largest prize ever for $18,346,673 and his second World Series of Poker gold bracelet. Hand #81: Antonio Esfandiari had the button, and raised to 1.8 million. Sam Trickett called, and the dealer fanned . Trickett checked, Esfandiari fired 2 million, and Trickett called. The turn was the , and Trickett led for 4.6 million. Esfandiari called. As "Redbull" Robbie Thompson announced that there was, "a big pot a brewin'," the completed the board. Trickett slowed down, checking to Esfandiari who fired 7.5 million. Trickett called. Esfandiari tabled for trip nines, and Trickett mucked. Hand #76: Sam Trickett started this hand on the button. He gave Antonio Esfandiari a walk. Hand #77: Antonio Esfandiari started this hand with the button. He raised to 1.8 million. Sam Trickett called and the dealer rolled out the . Trickett chekced and Esfandiari checked behind. The turn was the and Trickett bet 1.5 million. Esfandiari folded and Trickett won the pot. Hand #78: Sam Tricket had the button and called. Antonio Esfandiari checked his option in the big blind and the flop came down . Esfandiari checked and Trickett bet one million. Esfandiari folded and Trickett won the pot. Hand #79: Antonio Esfandiari had the button and raised to 1.8 million to win the pot. Hand #80: Sam Trickett was on the button. He made the call and Antonio Esfandiari checked his option in the big blind. After the flop, Esfandiari check-folded to a bet of one million from Trickett.